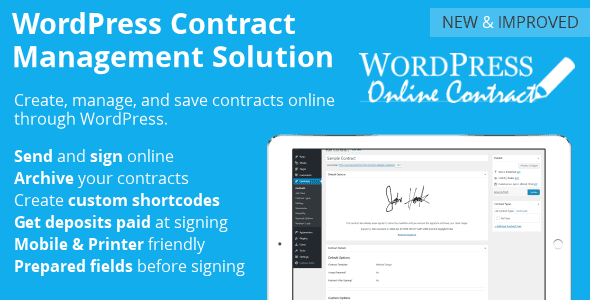 WordPress Online Contract is the original plugin that allows you to create, manage, and save contracts online through WordPress. You can customize contracts using flat text files and shortcodes and view revisions of your existing contracts. Give your clients a way to view and sign your contracts online in one place. ADDED REQUIRED FIELDS TO CONTRACTS Add a set of required fields to a contract that the user must complete before signing. You can set any shortcode field to be required on a contract before signing. ADDED PRINT NAME You can specify if you want a user to print their name on a contract before they can sign. BETTER UPDATE AND AUTHENITICATION Directly integrated with APIs to better authenticate and store purchase codes. More streamlined update functionality. PHP7 INTEGRATION Updated core code to work with newer servers and WordPress installations. MODIFY CONTRACT PERMALINK Setup your contract to work on the links you want. You are no longer limited to the /contract/ permalink. AUDIT LOG Every time a contract is signed, reopened, or changed a audit log is created. VIEW OPTIONS Once a contract is signed, you can still see the values but cannot edit until the contract is reopened. GUTENBERG READY Added functionality to use Gutenberg editor with contract display shortcodes. ADD NOINDEX / NOFOLLOW Added noindex / nofollow to contract to prevent search engine indexing. THEME COMPATIBLE Contract can either be displayed in your theme or without header and footer to display only a white page. BETTER JS HANDLING Integrated directly into WordPress’s core functionality for processing JS requests. CREATE YOUR OWN TEMPLATES Use WordPress’s built in editor create your own contract template. CUSTOM SHORTCODES Add your own shortcodes. PRINT CONTRACTS ONLINE Once signed, your client and print their contract and even pay the initial balance. FULLY RESPONSIVE Allows for any device to be used in creating, editing, or signing a contract online. UNLIMITED POTENTIAL Create unlimited templates, unlimited contracts, unlimited custom shortcodes. REOPEN CONTRACTS Remove a signature to reopen a contract for changes.